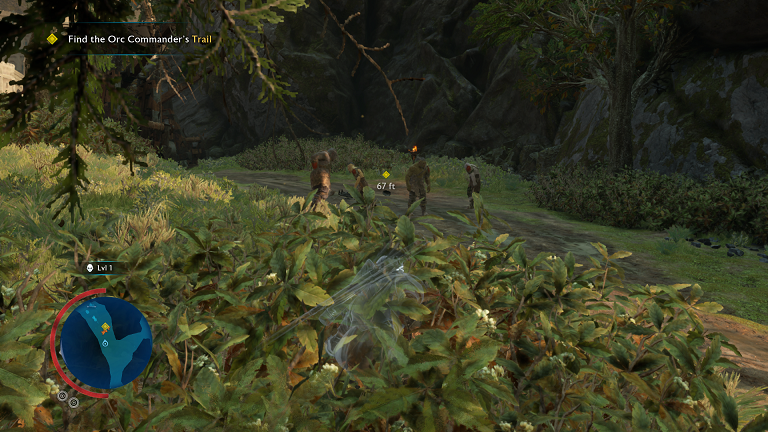 ​Few could have anticipated how big of a success 2014’s Shadow of Mordor would be. A light among a glitch-filled, disappointing year for games, it was the first sign that next gen had arrived with its amazing Nemesis system that could not be replicated on the seventh gen (as proven by lacklustre PS3 and 360 ports). So when a sequel was announced for 2017, it has naturally become one of the most anticipated games of the year. Taking the core concepts of its predecessor and expanding on them, it is a worthwhile sequel that makes a few missteps. After failing to stop Sauron in the first game, Talion – still possessed by the Elf lord Celebrimbor – attempts to craft another ring free from the darkness of Sauron. 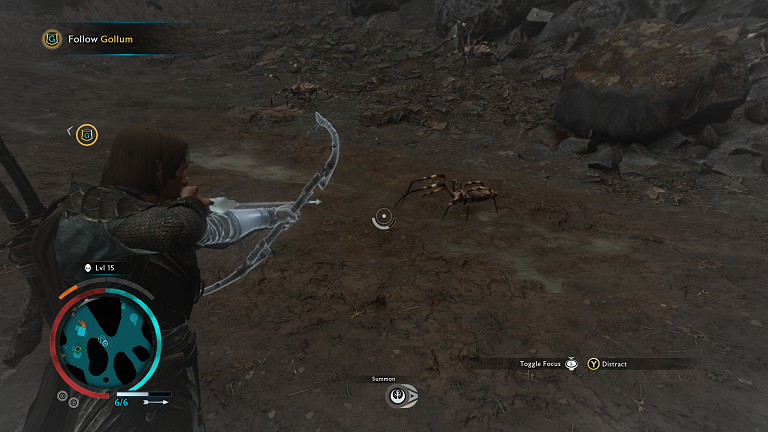 Things don’t quite go to plan, as Shelob, whom can transform freely between human and spider, captures Celebrimbor and forces Talion to surrender the ring to her. Yet, with a common foe in the form of Sauron, an uneasy alliance is formed as she uses the ring to aid Talion in fighting off Sauron’s invading forces. To be blunt, the story isn’t particularly engaging. 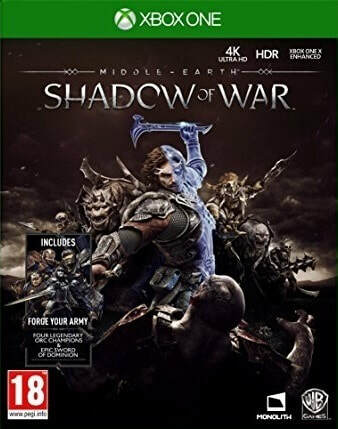 It has very little presence during the main chunk of the game, and while some characters are engaging, others are forgettable, including Talion who sounds half-asleep throughout. It experiments with the LOTR lore, but it doesn’t make for a compelling story. Shadow of War bares a lot of similarities to its predecessor. The movement and platforming remain very similar to Assassin’s Creed, but it works very well nonetheless, especially when you begin to earn special moves that allow you to sprint at high speeds, aim arrow shots in mid-air, and chain multiple stealth kills in quick succession. Combat too hasn’t changed a great deal, utilising the same crowd-control mechanics from the first, with button prompts allowing you to dodge and counter. It works well, but can prove overwhelming when there are several foes on-screen at once, making it hard to judge when to counter. Talion levels up via XP, allowing you to invest in skills and earn equipment which can be upgraded via mini challenges. It’s all a solid gameplay foundation which will please, if not astound, fans of the first game. What does impress is the sheer scope of Shadow of War. Shadow of Mordor laid the groundwork, but is a mere teardrop compared to the metaphorical ocean that is this game's world. Divided into several distinct regions, the game slowly expands in scope as you progress. Eventually, you can freely warp between regions, as you unlock fast travel points – as well as discover collectibles – via Haedir towers. It’s only once you reach Act II – and you begin recruiting your own orc army – that the game really reveals its epic scale. Massive battles to overtake strongholds are a highlight, with dozens of orc soldiers, creatures ranging from trolls to flying dragons and warchiefs roaming the battlefield. It’s quite a sight to behold when you begin your first takeover. This ties into the much-vaunted Nemesis system, which returns in full swing here. 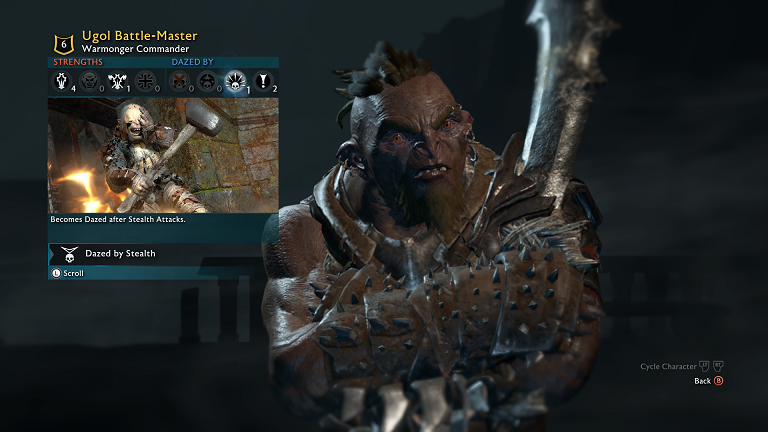 Like before, it generates unique orc captains, warchiefs and overlords for you to battle, with their own strengths and faults. If you are to die in battle by the hand of a generic grunt, they earn a promotion into this hierarchy, creating a new adversary for you to duel with who acknowledges your loss to them. Talion eventually gains the power to dominate orcs, allowing him to recruit his own army. You can fight orcs to the death, recruit them or shame them, the latter of which lowers their level and can even turn them deranged. Eventually, after recruiting enough followers, you can attempt to overtake a stronghold, building an assault force which you can assign to followers of your choice. Once dominated, you can them build a defensive line and buy upgrades to fortify your stronghold. It’s very deep, keeping you thinking about each moment. The problem is that Shadow of War struggles to showcase its strengths due to erratic pacing. Many of the story missions (including all of Act 1) fail to showcase these systems at all. While Acts 2 and 3 eventually start implementing these features with success, the final act is a crushing disappointment. Amidst an endless series of sieges, which force you to fight waves of overlevelled orc forces, the story appears non-existent, save for a hidden ending for those who can overcome this mountainous final section. It gives you time to experience the defensive mechanics more, but it’s gruelling, giving an out to the controversial microtransactions for less patient players. It’s a shame, because this inconsistent pacing really hampers the strengths of Monolith’s Nemesis system. Visually, Shadow of War is a mixed bag. It earns points for the huge amounts of on-screen activity, with dozens of foes, visual effects and animations all happening at once. It doesn’t tax on the frame rate either, keeping the action fluid. But nothing looks particularly impressive, from the unflattering character models to the dated environment details, it feels like a step sideways from a game that’s three years old now. The sound fares better, with sweeping musical scores that echo the movies very well. The voicework is also of mixed quality, while in contrast the sound effects keep the combat sounding brutal. It’s quite a meaty game as well. By the time you make it to the secret ending, your gameplay could easily come close to sixty hours. 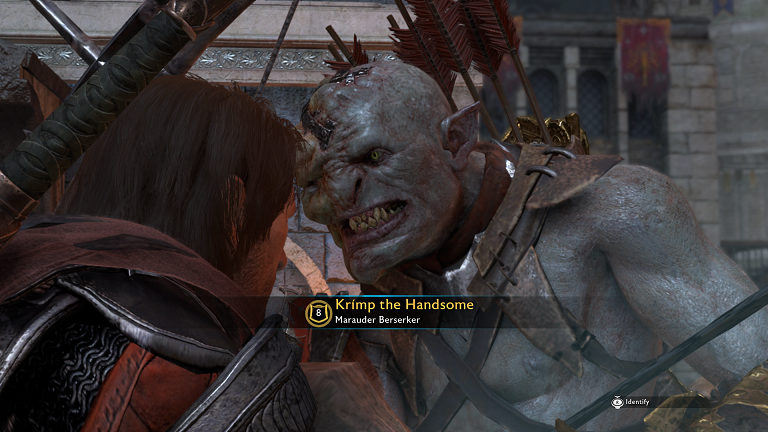 There are a few different story strands – including one with a hilariously brash orc who tutors you through all the nemesis mechanics - taking shape in the form of side missions, dozens of collectible items and of course, the Nemesis system which infinitely generates rivals and missions for you to tackle. It’s good stuff. There’s also a few online mechanics, allowing you to assault other player’s bases for extra loot, vendettas which allow you and others to avenge those who have fallen to warchiefs and daily challenges to keep you busy. While it doesn’t quite live up to the high standards of Shadow of Mordor, Shadow of War is nevertheless an expansive sandbox adventure with many ideas and a huge scope. You can’t really fault a game with such a huge world, epic battles and cool moments, but it sometimes struggles to put these excellent parts at the fore. The pacing is wildly inconsistent, and the story is disappointing. But it will please fans of the original, and those looking for a decent open world to spend dozens of hours in will also find it worth a look. "You can’t really fault a game with such a huge world, epic battles and cool moments, but it sometimes struggles to put these excellent parts at the fore... it will please fans of the original."